Are you a great fan of Dr. Who? If yes, then I am sure you will love this perfect tribute to the wonderful TV series – a Dalek birthday cake. Weighing almost 20 kilos, equivalent to more than 44 pounds, this birthday cake is nearly 22 inches high and is a perfect way to celebrate your best day with other Dr. Who fans. 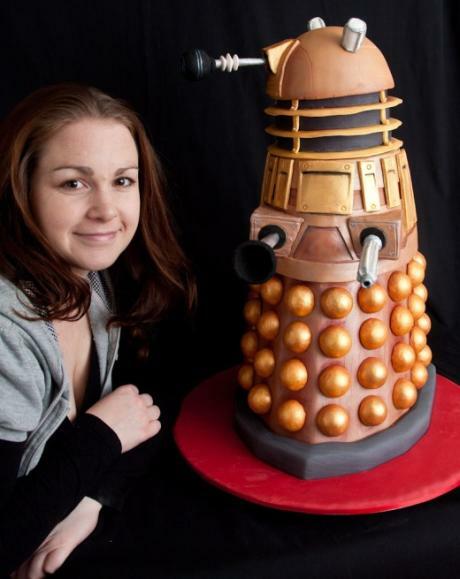 In the whole realm of stacked cakes, the Dalek cake might be the most difficult to make. However, this was made easier by creating design plans based on Dr. Who manuals. Styrofoam is used in several areas of the cake to ensure that the cake is lighter weight (as if 44 pounds was not enough) and there is less waste of resources. The design also includes 28 styrofoam balls which are split into half, covered with icing and then painted. The cake consists of two major portions which are covered with chocolate ganache and then in fondant and stacked one on top of the other. The other parts are slowly added and special focus given to the detail, all of which resulted in an exquisite, yet delectable, Dalek cake. To treat your taste buds to some other innovatively designed cakes, check out the Teenage Mutant Ninja Turtles cakes and the Harry Potter cake.